Here comes Barnyard Bath! 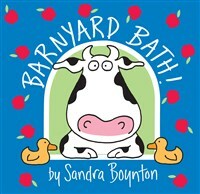 It’s a waterproof cousin of Barnyard Dance!—the famous board book bestseller. And what could make tub time more fun than a book? Especially one that floats. Because let's face it, board books are highly impractical in the tub. Safety-tested, nontoxic, and so much fun—just like Bath Time!, Boynton's first bath book.